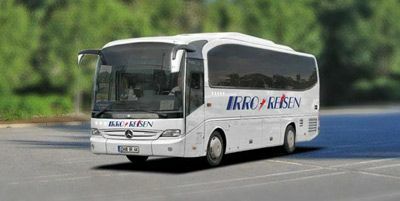 Tourino - Charter a Bus in Italy! Equipped with: Air-Conditioning, Fridge, DVD, Navigation System, reclining Seats, Bathroom, Kitchen, Trailer coupling, WiFi, GPS. Particularly suitable for: City Tours in Europe and Tours into the surrounding Countryside, mid-range Distances of up to 500 km, long-distance Tourist Travel and Business Bus Tours.